. . . and traumatic memory can affect not only the brain, but also the body and nervous system as well. 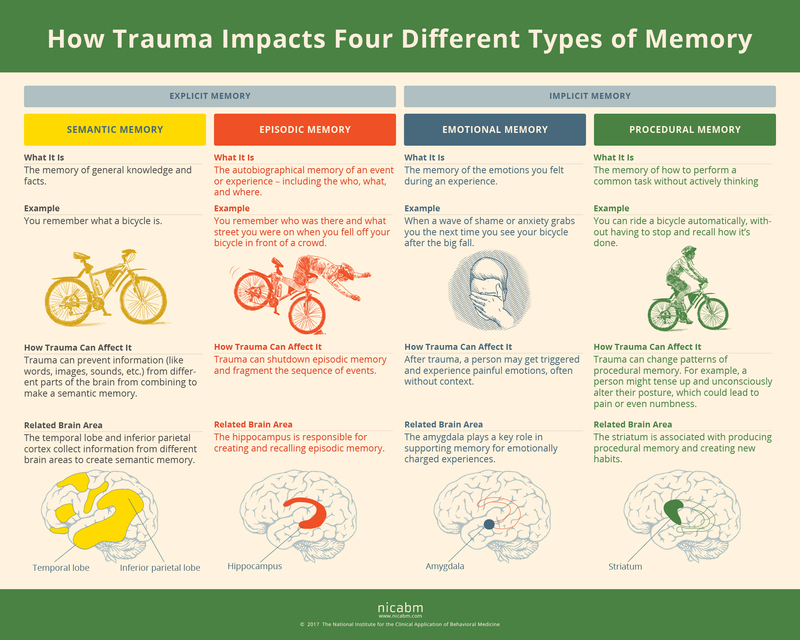 But conceptualizing how trauma can impact the different types of memory can be challenging, so we created a free tool for practitioners that breaks down this process. You can hear more about how trauma affects the brain, body, and nervous system in the Treating Trauma Master Series. You’ll get insights from Bessel van der Kolk, MD; Pat Ogden, PhD; Dan Siegel, MD; Stephen Porges, PhD; and Ruth Lanius, MD, PhD. Ortho-Bionomy can unwind physical trauma when the practitioner takes the client slowly back into the position, holds them there for 5 minutes, and slowly lets go. It’s as though the brain got stuck in the instant of trauma and is holding the muscles, etc. stuck in place. Emotional Freedom Technique (Tapping) is also very powerful to help with physical and mental trauma. Combined with talk therapy, it facilitates and greatly speeds the time needed for recovery. great easy way of explaining it! who is the author of this infographic? I love the information, and I need to cite it when I talk about it. The explanation with visuals is excellent. Teaching people that this is a physical reaction not a moral failure will be helpful in the healing process. Awareness is crucial. I would very much like to find out more. Over the years of my trama it seems to come out now. I think I burried it back in my brain. I am 55 now. When I was 11 I watched my father and brother drown right in front of me. I can still picture that moment being 11. And nine years later my boyfriend died the same way. It has made a very big impact on my life. I worry all the time that something with my children.